The Los Angeles Kings will potentially lose three of their four oldest players from the 2014-15 team in Justin Williams and Jarret Stoll, who are unrestricted free agents, and Robyn Regehr, who has stated his intent to retire. That would make Marian Gaborik, 33, the oldest player under contract for next season. That’s not a bad thing. 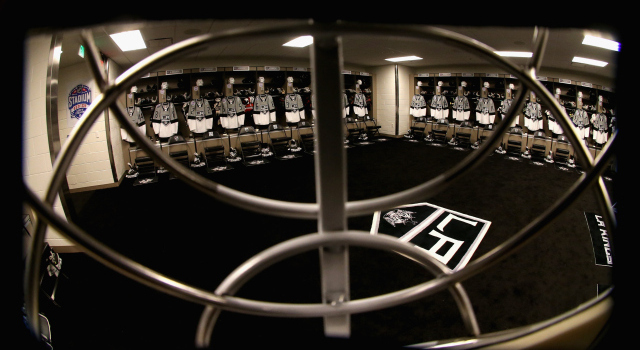 Of those currently under contract for 2015-16, 17 players have had their name etched on the Stanley Cup at least once, so it’s not as if there will all of a sudden be a dearth of leadership in the Kings’ room. The Kings also have several players in Manchester capable of stepping up to compete for a presence on next year’s Kings team. But Darryl Sutter has repeatedly discussed his partiality towards older players like Regehr, who are, as he often says, “an extension of the coaching staff.” The Kings don’t have the necessary cap space at this point to seriously consider a swing at an accomplished, experienced free agent, but would that be something they’d consider? Is the importance of bringing in another experienced figure to mesh with this accomplished group something the team is considering?